Naomi Binenfeld (left) uses her phone to show Tasneem Hayed how to check a voter's registration status. It’s Friday afternoon and, as the call to prayer begins at the Hamzah Islamic Center near Alpharetta, member Arif Kazi sets up a table near the mosque’s entryway. He puts out an American flag, flyers and laptops in the hopes of registering voters. “Are you registered to vote?” Kazi asks the tech workers, parents and elders rushing in for the regular prayer service. 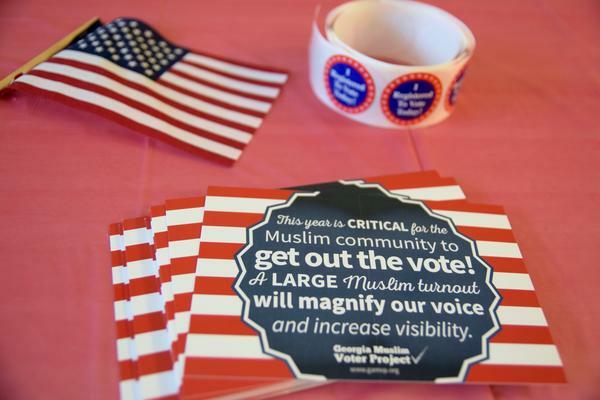 Muslims aren’t a voting group campaign strategists talk about very much. Not like white suburban women or African Americans, for example. In 2015 there were about 3.3 million Muslims living in the United States, about 1 percent of the total U.S. population, according to Pew Research Center estimates. Pew estimates that share will double by 2050. Right now, the percentage of the Muslim population in Georgia is likely less than that of the U.S. as a whole. According to the Association of Religion Data Archives (ARDS), in 2010 there were about 53,000 Muslims in the state. The U.S. Census Bureau’ 2015 estimate for Georgia’s population was 10.2 million. Their voting weight could be increasing though, sparked by Donald Trump’s harsh generalizations about the religious group, and Georgia Muslims are hoping new voters will give them more influence in local politics. Mohamad Elnaamani became a U.S. citizen just a few years ago. He stops by Kazi’s table at the Hamzah Islamic Center. He works for an international corporation in Alpharetta. Elnaamani says his voting choices are limited this year. He’s open to Republicans, even alternative party candidates, but Trump’s talk about Muslims has driven him toward Hillary Clinton. Elnaamani’s view on the election is the same as many at the mosque, says Kazi. He laughs when a reporter asks him what people tell him is motivating them to sign up. Kazi says for years he’s been trying to get more people from the mosque to vote. He says there are about 300 to 400 people who are already registered. They’re just a tiny speck, Kazi says, of the small percentage of Muslim voters in the U.S.
Muslim populations are concentrated north of Atlanta, according to ARDS, and Kazi says their numbers may matter more locally. In Georgia, Muslims are most often in the headlines when local governments block or stall construction of new mosques or funeral homes. With Muslims voting in local races, more politicians, especially north of Atlanta, may pay attention. That’s one goal of the Georgia Muslim Voter Project, a new nonpartisan political group focused specifically on getting Muslims politically involved. African-American Muslims tied to the civil rights movement have registered voters for decades, and more recently, Asian-American advocates have gotten more Muslims involved, but neither group focused specifically on the religious group. “Because there hasn’t been a specific effort for Muslims before we’re finding a lot more success,” said Aisha Yaqoob, the founder of the Georgia Muslim Voter Project. The group has a $15,000 annual budget, according to Yaqoob. Its goal: to register 800 new voters by November. On a recent Saturday morning, Yaqoob leads a seminar on how to register Muslims to vote. Yaqoob says some Muslim scholars argue voting goes against the Islamic faith, but the Muslim Voter Project gives trainees counter-arguments to take to their mosques. Yaqoob says foreign policy, particularly in the Middle East, energizes a lot of new registrants. But it’s local issues that will keep them coming back to vote, things like “who decides how often your kids go to school, the school bus routes,” Yaqoob says. She says if more Muslims realize how local decisions affect them it could even inspire people to run for office. 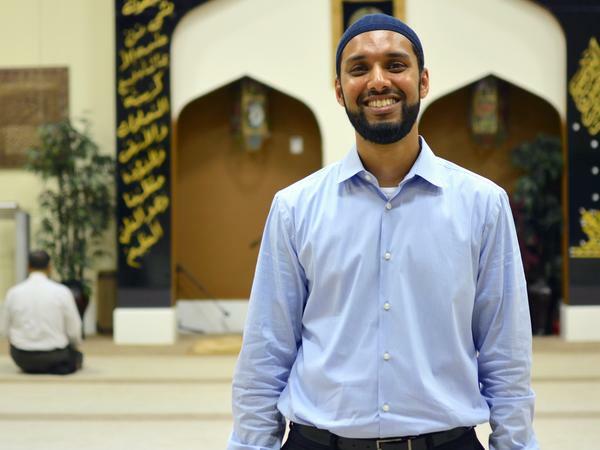 “The big thing I would say is, you know, don’t hate on us, because we’re coming for you at the polls and we are bringing partners with us,” Yaqoob says. Muslims, she says, are just one part of Georgia’s growing minority population who will influence politics here for years to come.